It’s hard to beat Angostura 1919 if you’re looking for a light sipping rum with a soothing, rounded heat. As I wrote in my review back in September, perhaps no other spirit is quite as relaxing or as complementary to a medium-bodied smoke. For those of us who also enjoy stronger and more flavorful stogies, though, sometimes the 1919 blend just doesn’t pack enough punch. That’s where the older and more expensive Angostura 1824 comes in. This highly esteemed rum honors the year Angostura got its start as a maker of concentrated food and beverage flavorings. The Trinidad & Tobago-based company’s beginnings can be traced back to 1824 when a surgeon general in Simón Bolívar’s Venezuelan army sought to improve the appetite and digestive well-being of the soldiers. 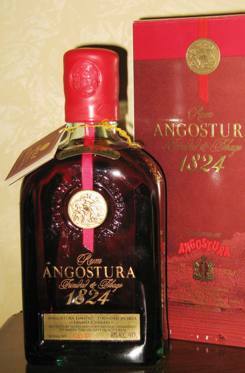 It wasn’t until 1947 that Angostura began to ferment, distill, age, blend, and bottle rum in Laventille, Trinidad. Today Angostura produces over 600,000 cases of rum each year, most of which is shipped to America, Great Britain, and other Caribbean islands. The 1824 blend, which sells for around $55 per 750 ml. bottle (40% alcohol by volume), is Angostura’s flagship rum. It is made from “the finest mature rums, hand-picked by the master blender from select casks.” Aged in charred American oak bourbon barrels for at least 12 years, the rum is hand-blended and re-casked until it reaches its “optimum maturity” before it is hand-drawn. Each individually numbered bottle of Angostura 1824 is decked out with a gold ornamental medallion and a wax-encased cork. Dark with a brilliant reddish hue, it pours with a pungent nose of sweet, smoky notes that include fruity orange and raisin and creamy honey and vanilla. I find the taste—which others have described as similar to toffee, spice, butterscotch, and nuts—is best compared to charred molasses and caramel. That smoky sensation from the nose carries over well to the palate. The finish is nearly everlasting, warm, and highlighted by a clinging spice. With this array of flavorful complexity, Angostura 1824 isn’t difficult to pair with a cigar. You’ll have to find your own perfect match through trial and error, but the LFD Double Ligero Chisel, Hoyo Petit Robusto, and the Montecristo Cabinet Selección Belicoso are good places to start. If this bold blend sounds like your cup of tea, and if you don’t mind paying top dollar for top-quality rum, go ahead and make an investment in a bottle. That decision will pay big dividends neat or on the rocks. At that price point I generally go with either single malt scotch or single barrel bourbon, but considering your review, I think that I will pick up a bottle of this rum. In my experience, some of the best rums (Zaya et al.) are a little too sweet to pair with most cigars. You definitely don’t have to worry about this rum being too sweet. And while I may be more of a rum fan than it sounds like you are, I can safely say the liklihood of you being disappointed in Angostura 1824 is small. Thanks, Patrick. Sounds like a winner. Now to see if my local liquor megaplex carries this elixir. I really think dark rum is becoming the new whisky. So glad you guys reviewed this one. I will be sampling it and reviewing it myself I think. I have been interested in trying fine rum but didn't know where to start. As a scotch and cognac drinker, this rum was fantastic. It has the warm properties of a cognac, but a slight sweetness that lets you know you are drinking rum. I had to special order this one, from my local shop.